Every home comes with a 2-car garage and a 200-acre Rec Room. 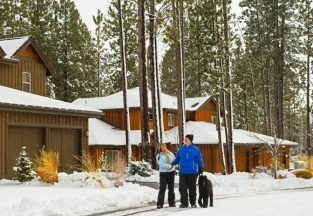 PointsWest is extraordinary for its close proximity to the Deschutes River and National Forest, as well as for being tucked smartly between Widgi Creek Golf Course and the Seventh Mountain Resort. It’s about as close as you can possibly live to the slopes of Mt. Bachelor. The community is comprised of 62 luxury townhomes, a dozen of which are adjacent to Widgi Creek’s 15th and 16th holes. All of the remaining homes have views overlooking the Deschutes River and Lava Island. PointsWest is designed to offer upscale, secure and carefree living for both full- and part-time residents, as well as for vacationers looking for a turnkey home. As part of the maintenance-free lifestyle, its community association provides all building exterior and landscape maintenance, snow removal and insurance. That means you can get rid of your lawn mower and snow shovel, and enjoy your free time.